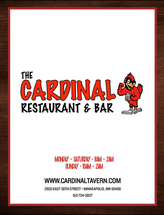 The #CardinalTavern kitchen is open until 11 p.m daily! Make It A Double for 2.00! Add French Fries, Tater Tots, Cole Slaw, or Cottage Cheese for $2.50. Add Onion Rings, Waffle Fries or Sweet Potato Fries for $3.75. Juicy Lucy Please allow 20 minutes.